So the holidays are almost here and your home just needs a little bit of Christmas cheer. Alright, I’m sorry; that was horribly cheesy. But I honestly couldn’t see the opportunity pass. Alright, so moving on, I know a lot of us would like to decorate our homes, but many home decor pieces are expensive and some DIY projects take a bit more time than they’re worth. And that’s why I decided to find budget friendly and super easy Christmas DIY decorations. Pinterest is full of dollar store supplies projects that’ll cost you little money and effort. Why not make your home look amazing with some simple decor ideas done by awesome bloggers? So check them out and let me know what you think! Now this is a beautiful way to add some color to your room. With just a few supplies, you can make these amazing centerpieces. If you want a holiday decor idea that really stands out, then I’d suggest trying this easy bright foil wreath. Definitely an eye catcher! These icicle ornaments are a great way to make your tree or certain centerpieces stand out. Now I think this is somewhere between a boho and farmhouse holiday decoration. At least, that’s the best way I can describe this super cute Christmas wreath. I love this adorable and pretty botanical ornament. It’s super simple and elegant as well. Candles are always a great way to make your home feel warm and cozy. And these DIY candle decorations are a great way to make it feel like the holidays. I’ve always been a fan of iced branches; they make for a great wall or table decoration. And now you don’t have to pay $25 for a set; you can make it yourself! I think this might just be the cutest dollar store idea yet. There isn’t much work you have to do and it’s a great way to decorate the table on a budget. Now if you really want to get creative, then definitely try out these adorable Christmas tree napkins. It’s not too much work and it’ll definitely impress the family! These paper evergreens are a great way to dress up your living room. Whether you place them above the fireplace or on a side table, it’s an awesome way to show your creative skills! 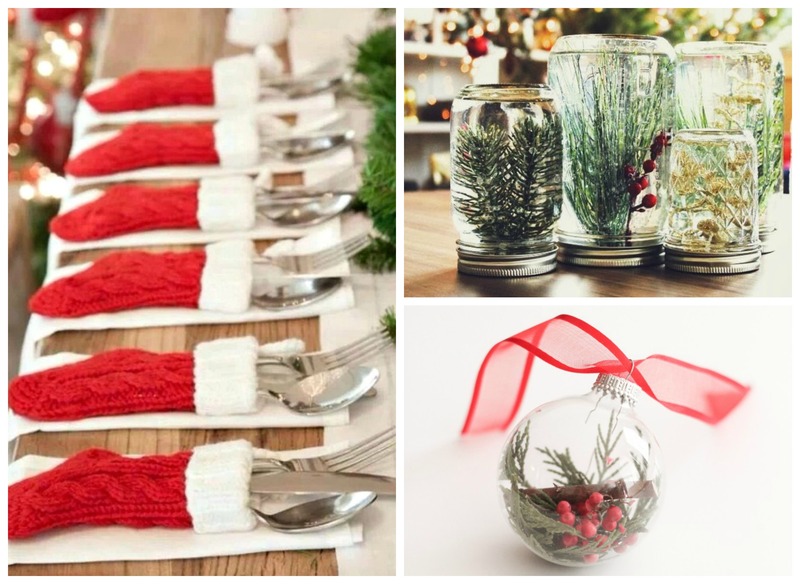 Whether you want to make mason jar globes or use cute mini stockings to hold your silverware, there are plenty of budget friendly and simple DIY Christmas decoration. Who says you have to pay good money for some cute pieces, why not make them yourself and add your own unique touch to the decor? Now if you have any questions about any of these DIY holidays ideas, let me know in the comments down below! I’d love to hear about them! These are such cute ideas but it would be helpfull if there were instructions and a list of items needed to go along with the pictures. Hey Jari! I’m glad you like them! The reason why I do it this way, is because I love sending people back to the original source (gives those bloggers the views they deserve for their hard work). I haven’t started decorating just yet but ideas are swirling in my head. Thanks for sharing this post with us!! I have gained a lot ideas from your post. You are so welcome Alessia!